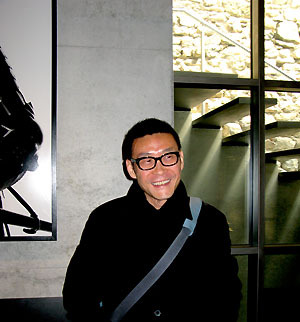 When the curator of Symptom, Zhang Ga, himself a media artist who spends his life between New York and Beijing, first saw the interior of the Château de Nyon, he was intrigued by the theatricality of the space. He immediately thought of Wang Jianwei, one of the most prominent and challenging conceptual artists on the contemporary Chinese art scene. The Château de Nyon, a half-hour drive from Geneva, has a succession of small, dark rooms with low wooden ceilings that provide a dramatic atmosphere appropriate to Wang Jianwei’s work. Symptom is a multi-media installation. It was presented in April 2010 in parallel to the film festival Visions du Réel at Nyon, which was partially devoted to China this year. Zhang Ga explains that Symptom “offers a formal language on the surface. But, underneath, there are costumes, dramas, historical references and a unique vocabulary.” A symptom is what a patient feels when something goes wrong in his or her body or mind. It is what the patient tells the doctor. But the degree of information provided by the patient reveals his or her background and understanding of the chronological order of the development of the symptom. On the other hand, the reading given by the doctor comes from his or her scientific approach and experience. So, what is the exact relationship between a patient and a doctor? And what can solve the problem? What is the part of science, art and philosophy when it comes to sensing the vulnerability and the instability of a society? The patient is a metaphor for the society composed of individuals taken despite them in the farce that is History with a capital H.
Born in 1958, Wang Jianwei started his career in the late 1970s as a painter. From the beginning his work was engaged with social interactions. 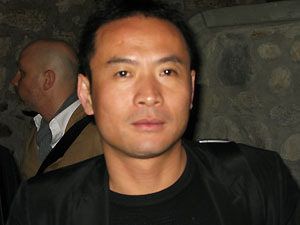 New media, introduced in China in the early 1990s, gave him a flexible format that was just beginning to be elaborated even in the West. New media gave him a vehicle to think about and to express the new paths that his country was suddenly being allowed to take. A broad new avenue for history was traced by the officials. But for a population still stigmatized, it was an avenue leading to the unknown. Artists like Wang Jianwei took small alleys emerging from the avenue swelled with official messages promising an economic future, but giving no key to create new models for expression. Symptom grew out of the cultural program “Swiss Chinese Explorations”, thanks largely to the drive of Marianne Burki, Head of Visual Programs at Prohelvetia, the Swiss foundation for culture. 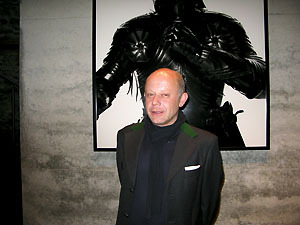 Vincent Lieber, the curator of the museum of the Château de Nyon, also played a key role in hosting the exhibition. He took advantage of the history of the space to enhance the theme of the exhibition. Symptom, involving multi-media, also worked in synergy with the film festival Visions du Réel giving priority to image. In Nyon, the exhibition was articulated around a large video screen, small videos, photos and a kinetic sculpture. The curator’s challenge was to assemble these different elements into different small rooms and still to give a feeling that they were linked together in order to create an impression of continuity. 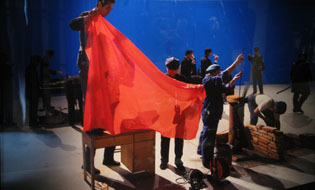 The videos are treated as mini-historical frescoes in which ancient China, the overthrow of the Imperial China, the early Republic, the creation of the People’s Republic of China in 1949, the open door policy in 1978, and the integration of the country into the global economy are compressed and mixed along a single time line narrative. The artist, Wang Jianwei, confronts us with history in its purest stereotypical perception. How does the West know China? Where are the nuances between our romantic vision of the past and our fears about a new imperialism? Stereotypes activate our behaviors. Here they explore how our knowledge is constructed when historical, social and cultural elements are interacting. Wang Jianwei says, “Stereotypes work on the visible and the invisible; on the relations between East and West.” For this reason, characters that he stages in his videos and photographs come from different times and social levels although they are all Chinese. The superimposition of historical contexts, social amalgam and individual paths make them strangely identical and out of phase. This feeling is enhanced by the fact that the photographs look like prints taken from the videos. In fact, they are carefully, methodically constructed as momentum of time. The effect is three-dimensional. Wang Jianwei discovered “installation” thirty years ago. It was a phenomenon coming from the West. Eventually, this concept changed his point of view on art. “Art is not one side or the other side of the coin. Contemporary art is an interrogation on society. Contemporary art can also be scientific in order to change people. Everybody thinks differently according to his or her personality, social implication and his or her knowledge. In China, we are at a strange moment: nobody is taking care of Chinese history, but when we look at politics we judge things through the history of China. Everybody has a different story and a different knowledge of oneself: that is the invisible part of the story.” Hence, in his videos and photographs, past and present coexist as visible and invisible through actions, gestures and clothing playing together in one unique scene. The strangeness created by the absence of a timeframe as well as the uneasiness provoked by certain images are reinforced by the semi-obscurity of the exhibition space. It is a scalpel versus anesthesia. An incessant sharp banging emanating from another room interrupts any drowsiness. 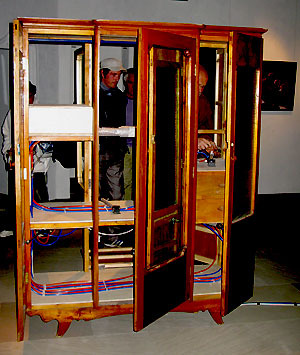 A featureless armoire stands like a throne, its doors continuously opening and closing. The noise resonates like our beating heart, which distills the passage of time without any particular chronology, in fact, with no chronology. The banging heard over the words of the artist creates its own resonance. What seems anecdotal, and even banal, questions in a vital sense where we are going and how we will get there. 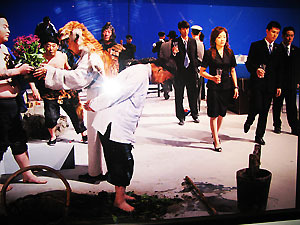 Mixing media to communicate ideas to a broad audience was a choice that the artist made in the mid-1990s. Wang Jianwei decided to stay in China to explore the social directions of his society. His work refers to Chinese culture and Chinese ways of living in the contemporary, but the questions asked are universal. We would like to thank Miss Li Yuan for her helpful translation of Wang Jianwei’s interview. Miss Li Yuan is currently studying at the Haute Ecole d’Art et de Design (HEAD) of Geneva, Switzerland.